Home Comment Who won the Question Time debate? Who won the Question Time debate? When I first saw the schedule for Assembly for Change, I was quite shocked by the array of people who were willing to travel away from civilisation to the prestigious venue that is George Fox lecture theatre 1. 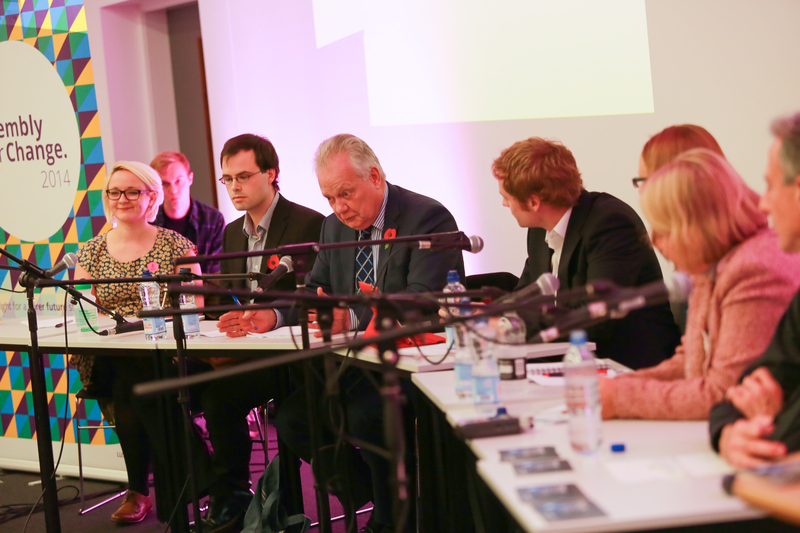 However, I was not just impressed to see a host of people making keynote speeches to get people engaged, but also to see the opportunity for the audience to get their own questions addressed by political figures: the Question Time debate. While it was a long distance from its namesake as far as production value went, as well as lacking a certain Mr. Dimbleby, it was as engaging as the televised alternative. For me, a key reason for anticipation of this specific item on the timetable was the audience participation, which was evident throughout and highlighted an obvious sentiment across the audience. Based solely on the reaction of the audience it was not always easy to tell who came off on top, but it was easy to recognise who suffered. Eric Ollerenshaw, Conservative MP for Lancaster and Fleetwood, squirmed in his seat during questioning, becoming all too aware of the left-wing sentiment at play. On topics such as the centralisation of power in London and the cost of living, he clearly didn’t realise that telling people to grow up and think more would just increase the bitter mutterings cast in his direction. Although there had clearly been an effort to present a political spectrum, the direction of the debate reflected a pretty uneven representation. As with the audience, it was positively left-wing. It felt almost intentional that Peter Tatchell was sat on the far left, with Green Party leader Natalie Bennett beside him (the two sat next to each other like a tag-team), and local Labour candidate Cat Smith to their right. Without even considering what was actually said, audience favouritism towards said three people was quite apparent. A notable contingent from the Young Greens and LUAC hollered whenever Tatchell or Bennett spoke, and Smith’s Lancaster University background gave her a perspective onlookers could immediately empathise with. Although it is easy to say the audience reflected a left-wing bias, it was obvious that people were captivated by Natalie Bennett and her Green ideology. It was refreshing to see a party leader who was not trying to accommodate for everyone, constantly playing it safe so as not offend anyone who might possibly wander into a voting booth. She was regularly greeted with rounds of applause for recognising the same problems with the modern political culture as much of the audience did. But what is perhaps most interesting is the way in which she livened up the debate. It was as though she hoped a representative of a major broadcaster was somewhere amongst the crowd. She not only held her own, but was forthright and perfectly suitable for that somewhat more important debate she wishes to be a part of. She was not the only person who benefited from the debate, though. NUS President Toni Pearce received some of the loudest responses from the audience, despite spending most of the day with a target on her back after the right honourable mess that was the NUS’s statement about the free education demo. In her speech, she mentioned that students are often portrayed as single-issue voters (clearly meaning tuition fees) and powerfully articulated other concerns on the cost of living and political education. She struck a chord with the students, staying away from party politics and addressing the problems that students regularly face. All the while there was another important battle in play: the race to represent the Lancaster and Fleetwood constituency. Despite currently sitting in as the MP for our constituency, Ollerenshaw appeared confident in his own stance on issues taking firm positions, but did not receive a response that suggested a shared position amongst those watching. Robin Long, whom it is hard not to consider the sixth panellist, seemed like a lamb for the slaughter at the start. He was perhaps as happy as Toni Pearce was that tuition fees were not the focal point of debate, but very much had the characteristics of Liberal Democrat. He was largely inoffensive and sometimes ineffectual. Towards the end, however, possibly as his confidence that he wouldn’t get glared out of the building grew, he received cheers and clear approval from parts of the audience. Whilst possibly not enticing any new supporters, he might have achieved the Lib Dem goal of keeping the support of previous voters. Within this three-way competition, while picking an outright winner is bound to be tricky, there is a clear victor. This may be the most clichéd thing ever put to paper, but the audience were the winners – not just during the debate but during the whole weekend. The grand finale of a weekend of political participation and engagement made me, and many others, feel like I could make a positive difference in May 2015 and for many years to come.